Marzipan is often formed to make tiny animals or fruit to eat as is or as a decoration for cakes. Enjoy your marzipan today with a good picture book! Try this one about a little girl made of marzipan. Therese and Jacques were two bakers who lived in Canada. They had no children. And one day Jacques formed a little girl out of marzipan sugar. She was small and fragile but she came to life overnight. They named her Matina. They were always afraid that she might break or melt since she was made of sugar, but she was so sweet that everyone treated her gently. Matina had one special friend named Jean-Paul who was also weak due to a lung disease. Matina and Jean-Paul became very close, then one day Jean-Paul did not come to school. Matina’s parents were afraid to tell her that he had grown very sick for fear that she would cry and melt away. So they told her that he had taken a long trip to Montreal. Later, Matina learned the truth and ran to Jean-Paul’s house to see him. He was so pale and weak that she couldn’t help but cry. Her tears landed on his face turning his cheeks a rosy color. 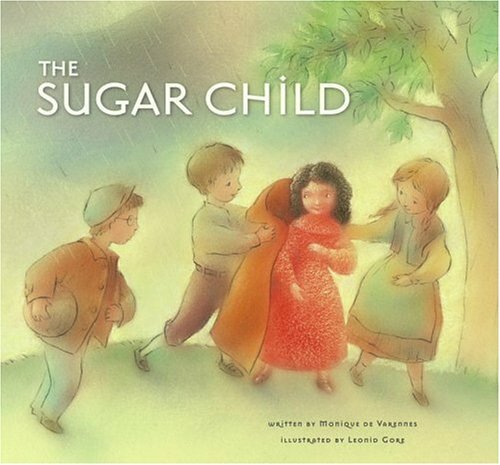 And when Jean-Paul reached up to dry her tears, he noticed that under the sugar layer Matina had flesh like a real child. She was so excited that she ran outside in the rain and melted all the sugar off her body, for she knew that she was a real child at last!